On Monday 19 September, the University’s Vice Chancellor, Professor Max Lu and Head of Surrey Business School, Professor Andy Adcroft welcomed business delegates from across sectors to officially launch Surrey Business School’s Business insights Lab. The Business insights Lab brings ideas and people together, putting the latest thinking into practice within the digital economy. Volatility. Uncertainty. Complexity. Ambiguity. ‘VUCA’ is the defining symbol of the Digital Economy. The Business insights Lab (BiL) is a unique resource that helps us – collaboratively – to define, interpret, and navigate the digital landscape: from obstacles to opportunities; from old habits to new models; from disruption to new connections; from confusion to clarity and effective prediction – finding solutions to an equation that is constantly in motion. The Times and Sunday Times Good University Guide 2016 praised the University of Surrey for being one of “the most innovative universities in the UK” and Surrey Business School’s Business insights Lab is innovation in action. CoDE was delighted to participate recently in an event to showcase and officially open the Lab, when the University hosted donors Alberto and Maria Verme, along with new Vice-Chancellor Professor Max Lu and guests from across academia and local industry, for a celebration, ribbon-cutting, lab taster-session, and Q&A. Since opening its doors in September 2015, the Lab has engaged with over 30 companies and over 400 students from across the University to deliver a positive learning experience. 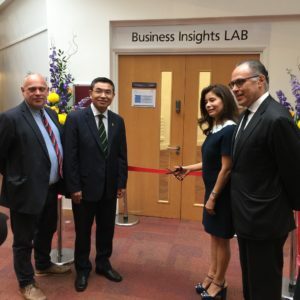 Designed to teach business skills for the Digital Age, the Business insights Lab draws together research, teaching, brokering and problem solving, tapping on our strengths across the University, to foster new business innovation strategies. In the BiL, we don’t just study theory; we shape and develop new practice through collaboration and experimentation. A constant stream of digital technology changes, optimised production practices, and flexible global delivery models has quietly turned into a revolution in business models, consumer expectations, and societal behaviours. The result: a ‘mash-up’ of sectors, issues, unexpected problems, and unlikely bedfellows – and a future that’s virtually impossible to predict. Our students problem-solve creatively, with unexpected partners, tackling ‘wicked problems’ in a changing landscape, and learning interactive skills and methods around innovation and entrepreneurship.